Home / children in church / childrens ministry / Church / Church of England / Good shepherd / Jesus / sheep / Are you a good shepherd ? Are you a good shepherd ? with lambs. 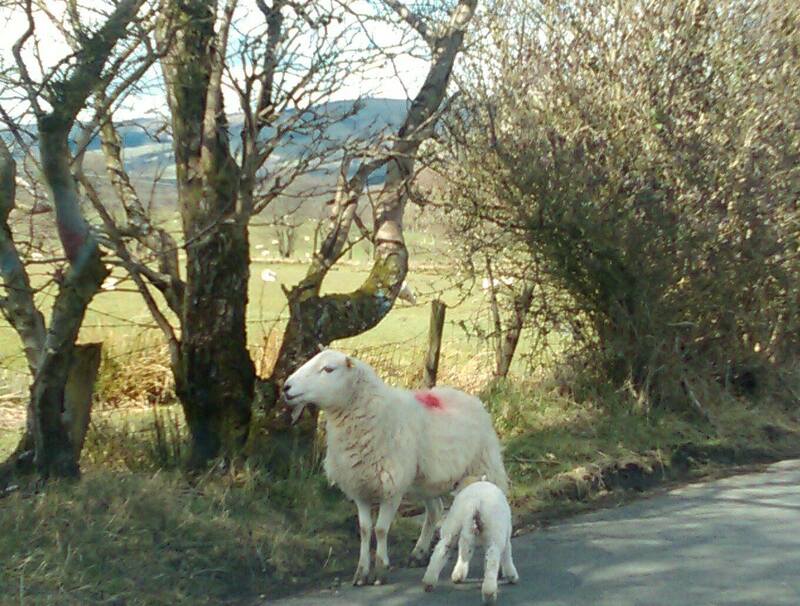 Do you know how noisy sheep can be especially when they have lambs? Calling out to them when they wander off or when there is danger. I open the window in the morning and the sheep are calling. I have also seen the sheep waiting for the farmer to come with food – when they hear him there is a stampede, I imagine them saying to each other.. Dinner time everyone..
As I was driving back from church today there was a lamb the wrong side of the fence with it’s mum on the right side of the fence. I stopped the car and it tried to get through the holes in the metal fence. After a bit of a chase – I picked it up and put it over the fence. Only to find on the way back down the same road, another Ewe and lamb! Sheep! In biblical times farming was different, shepherds stayed with their sheep. They fed them by taking them to different places where the grass was good, they led them to water, (they didn’t get it from a tap like today’s farmers), they groomed them and sheared them. (like farmers still do today). He delivered the lambs, he led them and kept them together, watched over them at night, and when a sheep wandered off he went to find it. Shepherds in biblical times were often the youngest boy. This was passed down as more children were born especially if his father grew crops as well. As the older children were involved in planting, weeding and harvesting the crops. We learn a lot about what it was like being a shepherd from the bible, David was the youngest and therefore a shepherd, he was looking after the sheep when he fought Goliath. Last Sunday the sermon in our church like in many churches following the lectionary was about fishing and shepherding. Our vicar told us that we were very good at shepherding, but not so good at fishing. I will never forget her words – we need to fish for sheep and then shepherd the fish. It made me smile as I imagined our church sitting there waiting for a fish to go by and trying to catch them..
Today in our churches we are all sheep, with Jesus as our Good Shepherd. But at times we are called to be shepherds and we need to copy what the Good Shepherd does for his sheep. What do I have to do to be a good shepherd? Like Jesus told Peter we need to feed our lambs and sheep. In biblical times the sheep needed to be led to fresh water, and the shepherd needed to plan where they were going to take the sheep to feed them. Moving them to new pasture when needed and in the winter when food was scarce finding an alternative source of food. If we are the sheep in church what kind of feeding do we need? We need to be fed the word of God, and to know what that means in our lives. How does it relate to me? What does it mean in my life? We need to learn together from each other. In biblical times when the shepherd took the sheep to the watering hole they wouldn’t always be the only flock there.. the sheep got mixed up. When it came to moving on the shepherd would call them and they would recognise his voice and follow him. The sheep knew the tone of the shepherd’s voice – so even if stranger used the same words the tone wouldn’t be the same so they would know it wasn’t their shepherd. A shepherd spent every day with his sheep, he knew every marking on them.. he cared for his sheep. The Indian theologian D. T. Niles once noticed a young Indian shepherd boy keeping a huge flock of sheep. He stopped and asked, "How many sheep do you have?" "I don't know," answered the boy, "I can't count." Niles asked him, "How do you know if some of the sheep haven't wandered off when you get to the place where you're going to camp at night?" To his astonishment, the boy answered, "I don't know how many wander off, but I know each one. I can't count, but each sheep has a name, and I know their names." Jesus knows each one of us, he knows our names our characteristics and he cares for us. Jesus the Good Shepherd cares for his sheep, that what we should be doing to. Showing care and compassion for other people not just on a superficial level, but really getting to know each other. Understanding and being there when things get difficult. A shepherd looks after the lambs as well, just as we need to look after and nurture the children. We need to help them learn the lessons of the bible, encourage them to come to children’s church. To take their place within the life of the church and to become good shepherds themselves. There are many sheep crafts available. A digestive or tea biscuit. cut the mini oreo biscuit in half so that you have a dark background with a white centre showing. Put the chocolate drop on the oreo as an eye. I also have made a game: Being a good shepherd - Leading the sheep from the beginning through the dangers, feeding and watering them, protecting them from the wolf, helping them out of the thorns. Here is a template of a game, have fun and add things to it. Throwing the dice to get from beginning to new pasture.